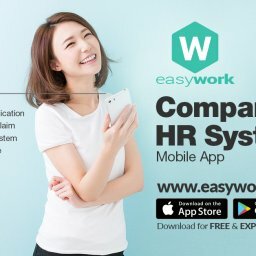 Home About Easywork EasyWork beneficial to which type of Industry? Even an ordinary business sales team can use EasyWork to check in (at any location) for appointment. If a team leader/boss wishes to know whether the team members are working on finding new leads/following up closely, he or she can easily do the checking. Moreover, those who are indoor based can also make use of EasyWork Attendance feature. Why? This is because EasyWork’s powerful location feature that works like Pokemon Go is cool enough to accurately detect check in and check out, helping SME to Save Cost (no more buying any hardware equipment/machine for attendance recording). And you know what? Mileage claim feature is coming soon! With EasyWork, you can easily make announcements in a proper recorded system and your colleagues can easily refer to what have been previously announced by the company. In the case of an F&B business, managers can easily make announcements to team members regarding stocks/ingredients that require replenishment, or which menu is not available from the kitchen today. Big organizations have lots of events and activities — general events for everyone, events that are reserved for respective departments. With EasyWork, organizations can easily inform their members of event time, venue or update event details when there is a change. Everyone can stay updated with real time notifications, a powerful feature of EasyWork. In addition, EasyWork’s poll feature allows managers to find out the preference of team members, such as what type of activities/venue/time/prizes are preferred for an event. Even a lawyer firm/ clinic can make full use of EasyWork’s announcement feature, for example, announcing which files have been brought in, and which case needs immediate follow-up. It can be a platform for a team and company. Every single word is properly recorded to prevent mistakes. Shops can make announcements easily to their workers even when the manager is away. Employees can easily clock in their attendance when they arrive at work. What if the stocks are running out? Employees can even apply to top up the stocks easily and efficiently using an in app request form. Banks and investment firms are in great need for a platform to make announcements to their teams accurately. When using WhatsApp Group/WeChat Group, certain important messages/information can get crowded, and team members can hardly find the important message after a while. But with EasyWork’s announcement feature, team members are easily notified, and every message is well recorded for future reference. Moreover, more often than not, since bank employees have a great number of events to attend, manager can set the events in EasyWork’s office calendar. For instance, when there are incoming roadshows/seminars, managers/team leaders can easily set up a date (with complete event details) in the office calendar, and all team members can be easily reminded of the events they need to attend. Easy, Efficient, and Zero Hassle! EasyWork’s powerful attendance feature offers great benefits to any office to boost productivity and save cost. Imagine all employees can clock in and clock out accurately without any hardware. All attendance are easily recorded for future reference. Make Office Announcements with just a few taps. No more sending emails or putting up a notice! Everyone is aware of announcement by notification. An isolated platform to make announcement can be deliver clearer message instead of mix in communication group chat.